Released March 2002. The 1,032 page full length history of Hitler's WW2 years, based on private papers, diaries, and interviews of his staff. Constantly revised and updated over 30 years. A standard work, with 40 pages of color and b/w photos. Italian, Greek, Polish, rights sold. Released July 2001. The 1,024 page second volume (1941-1943) of the major biography of Churchill's WW2 years, based on private and official papers and diaries; a 30 year project. A standard work, with 32 pages of color and b/w photos. Originally a newspaper series published by Welt am Sonntag, Germany; expanded to a full length book over 20 years, including the private papers and unpublished diaries of the Nazi war criminals and the Allied and Soviet prosecutors and judges. This very popular book has 300 pages, 32 pages of rare color and b/w photos of trial. Italian and German rights sold. The author was the first to be allowed to use the Goebbels diaries found in the KGB archives in Moscow. He had already spent 8 years researching the Nazi propaganda minister's life from other sources. 700 pages, 40 pages of rare color and b/w photos. In 1990 Mondadori commissioned Mr Irving to transcribe and annotate the hitherto missing 1938 volume of Dr Goebbels handwritten diaries, found in the KGB archives in Moscow. He wrote an extensive introduction to the diary. 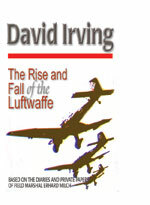 Updated edition of Mr Irving's first bestselling history of the British/American holocaust air raid on Dresden which mkilled up to 100,000 Germans in one night. 256 pages, and pages of exclusive, horrific color and black and white photos. Writing in German, Mr Irving produced a history of the Allied WW2 conferences which created Germany's controversial eastern frontier with Poland. A little monograph, relying largely on the private diary of "bouncing bomb designer" Dr Barnes Wallis: originally a Sunday Express series (free download), Mr Irving developed it into a book in German. With the availability of US files on Göring's Forschungsamt, Mr Irving expanded his 1967 book Breach of Security into a full length German-language history of the Forschungsamt, the equivalent of the US National Security Agency. It remains the only history of this important Nazi wiretap and codebreaking intelligence agency. 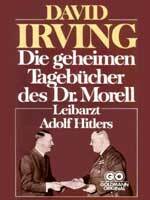 In 1991 Mr Irving's own imprint produced an abridged, updated, and revised edition of his Hitler biography including the pre-war volume in one edition. This is superseded by the 1002 Millennium edition above. First published by Grafton in August 1990, this is a revised,popular abridged pocketbook version of the original hardback edition of the diaries of Dr Morell (below). The Australian publisher Veritas produced this edition of the first volume of the Churchill biography, 1933-1941, and it was reprinted by Arrow Books (Random House) and by Avon Books (USA). It is now out of print, and a new revised edition is in preparation in the same style as the impressive volume ii. Never published in the USA, due to a clumsy mailing mishap by Macmillan, this book appeared in the UK on the death of Hitler's deputy, Rudolf Hess, after 47 years in Spandau prison. The book was the first to use the secret British archives, and the entire medical diaries of his captors. An updated edition is in preparation. Based in part on the private diaries of Hermann Göring, and on his private correspondence with his first and second wives, this is the first full length biography of Hitler's No.2. Edited by leading US editor Thomas B Congdon. It rated first class reviews around the world. In German only, a facsimile compilation of documents surrounding this controversial and vindictive 1944 plan by President Roosevelt's Treasury Secretary. In 1982 Mr Irving discovered in the US National Archives the hitherto unknown handwritten diaries of Hitler's private physician Dr Theo Morell, and his treatment files on the dictator ("Patient A"). He transcribed, translated and annotated them. 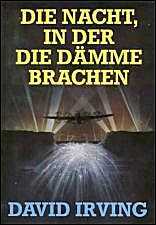 Writing in German, Mr Irving produced this short monograph on the development of aerial warfare against civilians. A highly successful and often hilarious account of the rivalry between the British and American top generals during the 1944-1945 battles in France and Germany. Edited by leading US editor Thomas B Congdon, it is based on the generals' unknown private letters and diaries. Using files in Budapest and Moscow, as well as the British and American official archives, Mr Irving produced the first full length narrative of the tragic failed 1956 uprising against the Soviet occupation of Hungary. It was serialised for several weeks in Der Spiegel. Wie Krank War Hitler Wirklich? Before Morell's diaries became available (see above) Mr Irving wrote a series of articles for Der Stern magazine in Germany, using the papers and interrogations of all the doctors who had treated Hitler. The articles appeared as this very popular and readable paperback book in Germany. Mr Irving wrote a series of articles for Welt am Sonntag magazine in Germany, using the private papers and unpublished diaries of the Nazi war criminals and the Allied and Soviet prosecutors and judges. 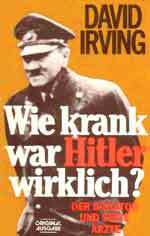 After publication of his wartime Hitler biography, Hitler's War, Mr Irving published the prewar chapters in a separate book. Abridged and updated, they are included in the latest Millennium edition. This first edition of Mr Irving's wartime Hitler biography, it is superseded by the 2002 Millennium edition. Researching for the Hitler biography, Mr Irving learned that Field Marshal Erhard Milch was keeping back his private diaries for his own biography; Mr Irving volunteerd to write that work in order to obtain access to this source. The book was a major serial in Bild am Sonntag, and a great success in Germany and the USA. The Memoirs of General Gehlen transl. After the original German version of these memoirs proved too thin for the US publishers, they commissioned Mr Irving to translate and flesh them out. Mr Irving translates and comments on an important August 1939 product of hermann Göring's wiretap agency, outlines the agency's work and olther achievements. See Das Reich hört mit above, which supersedes this book (though in German only). Rolf Hochhuth, who wrote a play about Churchill and Sikorski, Soldaten, prompted Mr Irving to research the mysterious 1943 death of the Polish prime minister. The British government expressed deep concern about Mr Irving's work. An updated version of the book will be published soon. 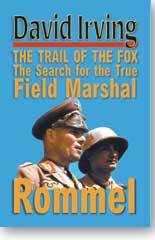 The Memoirs of Field-Marshal Keitel transl. (New US edition published 2001 by Cooper Square Press). Originally published in German in an abridged version by Walter Görlitz, the deathcell memoirs by Keitel were translated by Mr Irving, who went to the trouble to put back in all the passages excised for political reasons by the Germans. Built around a ceentral set-piece narrative of the heroic British air attack on Hitler's Peenemünde rocket research station in August 1943, this book describes the development of the Nazi V1 and V2 missile projects and the British countermeasures. It was serialised for several weeks in Der Spiegel. Now superseded by the 1996 book Apocalypse 1945: the Destruction of Dresden (see above), David Irving's book was the first to reveal to the non-German readers of the world the horrifying story of the British and American air attack on Dresden in February 1945. It was serialised for three weeks by The Sunday Telegraph. In 1961 the German wseekly managzine Neue Illustrierte ran a series of articles written by David Irving (and ghosted by journalist Günter Karweina) narrating what was still a taboo subject for German writers, the British saturation bombing of german cities. The series ran for 37 weeks, and was reprinted in this superbly illustrated Swiss book edition in 1963.